III. On the Aberration of Light. 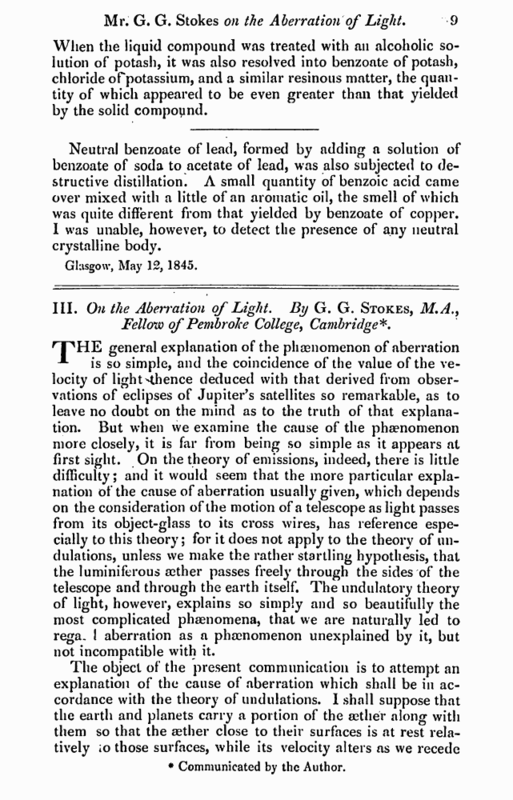 By G. G. Stokes, M.A., Fellow of Pembroke College, Cambridge *. 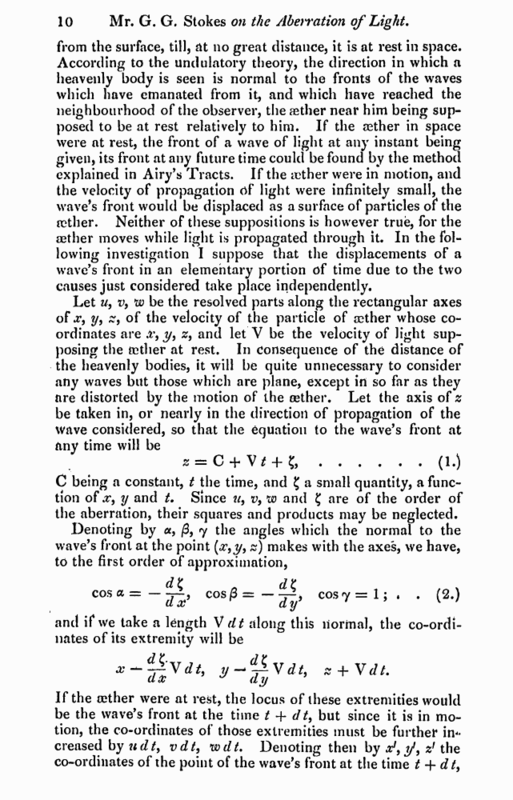 THE general explanation of the phaenomenon of aberration is so simple, and the coincidence of the value of the velocity of light thence deduced with that derived from observations of eclipses of Jupiter’s satellites so remarkable, as to leave no doubt on the mind as to the truth of that explanation. But when we examine the cause of the phenomenon more closely, it is far from being so simple as it appears at first sight. On the theory of emissions, indeed, there is little difficulty; and it would seem that the more particular explanation of the cause of aberration usually given, which depends on the consideration of the motion of a telescope as light passes from its object-glass to its cross wires, has reference especially to this theory; for it does not apply to the theory of undulations, unless we make the rather startling hypothesis, that the luminiferous aether passes freely through the sides of the telescope and through the earth itself. The undulatory theory of light, however, explains so simply and so beautifully the most complicated phenomena, that we are naturally led to rega. I aberration as a phaenomenon unexplained by it, but not incompatible with it. The object of the present communication is to attempt an explanation of the cause of aberration which shall be in accordance with the theory of undulations. I shall suppose that the earth and planets carry a portion of the aether along with them so that the aether close to their surfaces is at rest relatively io those surfaces, while its velocity alters as we recede * Communicated by the Author. from the surface, till, at no great distance, it is at rest in space. According to the undulatory theory, the direction in which a heavenly body is seen is normal to the fronts of the waves which have emanated from it, and which have reached the neighbourhood of the observer, the aether near him being supposed to be at rest relatively to him. If the aether in space were at rest, the front of a wave of light at any instant being given, its front at any future time could be found by the method explained in Airy’s Tracts. If the ether were in motion, and the velocity of propagation of light were infinitely small, the wave’s front would be displaced as a surface of particles of the aether. Neither of these suppositions is however true, for the aether moves while light is propagated through it. In the following investigation I suppose that the displacements of a wave’s front in an elementary portion of time due to the two causes just considered take place independently. C being a constant, t the time, and £ a small quantity, a function of x, y and t. Since «, v, w and £ are of the order of the aberration, their squares and products may be neglected.